2.Do not put the item into solar exposure,heat source,fire,flammable and violently source. Leave it in car is not allowed,because the high temperature will damage the product. 【WIDELY COMPATIBLE】-Ayyie solar charger is Suitable for a wide range of electronic devices such as iPhone, iPad, android cellphones, other smart phones, tablet, camera, PSP etc. 【ULTRA HIGH CAPACITY】-Solar power bank has 13500mAh battery capacity, which can charge iPhone 5s four times, iPhone 6s three times, Samsung Galaxy S6 two times, iPad mini 1.6 times. 【Dual USB Ports】-Solar battery charger has 5V/2A input USB port and 5V/2.1A output USB port for iPad/Tablets, iPhone, android phone and other smart phones or other electronic devices. 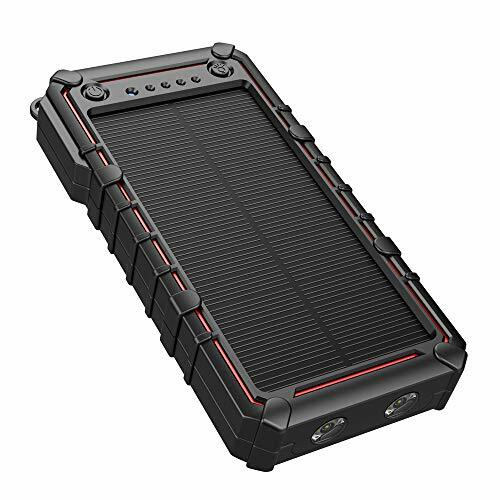 【Built-in Dual LED lights】-You can use this solar phone charger as a torch, which three modes：on、slow flash、SOS flash; it is really useful and helpful for you when in dark situations or other emergency usage. 【Two Ways of Charging】-You can not only charge the solar battery pack by charging cable but also by solar light, but the solar charging is not the prime charging way, we highly recommend the wall charger.